CENTRE FOR LEGAL AID ASSISTANCE & SETTLEMENT (CLAAS) started in 1992, with the commitment to address the acute need of legal aid assistance, protection and settlement for the victims of religious intolerance (especially victims charged under blasphemy), human rights violations faced by vulnerable groups, such as religious minority’s women and children. CLAAS is a Multi-religious Organization and helping victims of abuse and discrimination without cast and creed. Therefore, a group of concerned Christians along with few progressive Muslim colleagues encouraged Mr. M. A. Joseph Francis to start working for the protection and promotion of human rights and formed CLAAS in Lahore. The CLAAS operates and works at secular & ecumenical level and this incorporation is visible in the CLAAS board. Mr. M. A. Joseph Francis started this initiative as human rights activist in 1965 when war broke out between India & Pakistan and the Christians were blamed as traitor and spy as Indian secret agent. Through these serious allegations under defense of Pakistan article 132-A & 132-B thousands of Christians were arrested and hundreds of Christians were murdered. In that situation Mr. Joseph Francis began talks with government officials for release of innocent Christians. Later Mr. Zulfiqar Ali Bhutto came in to power as Prime Minister of Pakistan he therefore released the innocent Christians arrested under the fake charges deserter. The hatred against Christians never ended till date and the period from 1977 to 1988, when the military dictator, General Zia ul Haq, got rid of his political & fundamentalist adversaries to enjoy economic, social and political freedom to obtain religious backing for his spread of fundamentalism and obscurantism of Islamization and forcedly introduced discriminatory legislation such as including, Hudood Ordinance relating to Zakat, Ushr, Qisas and Diyat, the Qanoon-e-Shahadat (Law of Evidence), Blasphemy Laws under sections Pakistan Penal Code (PPC) 295, 295-A, 295-B, 295-C (the most draconian of all laws offence punished with death or imprisonment for life), 298 A, 298-B and 298-C PPC added for Ahmadis. The disparity of political strength encouraged the overzealous Islamists to persecute religious minorities through these laws of blasphemy. A separate electorate system was introduced which was based upon the religious identity of the citizens whereby persecution against them also increased in government services. Non-Muslim citizens could not contest as general candidates in the parliamentary elections. Under 167&168 Martial Law Order the Christian educational institutions nationalized and captured. A separate column introduce for obtaining national identity cards as well as in the passports. Article 2 of the Constitution of Pakistan declares that Islam is the state religion and Article 2-A makes the Objectives Resolution a substantive part of the Constitution. Non-Muslim citizens cannot hold two of the highest public offices (The President & The Prime Minister) of the land and Islamic provisions of the Constitution (Articles 227-230) are designed to ensure that all laws conform to the Holy Quran, Sunnah and enforcement of the Federal Shariat (Islamic Fiqh-Jurisprudence) Court. Resultantly the discriminatory legislation prompted an atmosphere of intolerance against religious minorities in the country, which not only encourages sentiments of religious prejudice and bigotry against non-Muslim citizens but also poses a serious threat to basic human rights. The laws interpreted with chauvinism against non-Muslims and consequently the courts are biased also influenced by radical extremist elements. The citizens belonging to other faiths are systemically excluded and relegated to a secondary position. 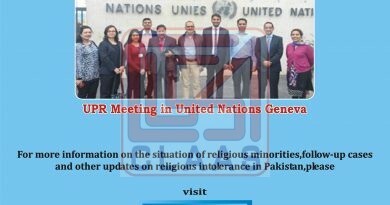 Religious discrimination, inequality and contemptible legislation institutionalized within the state structure which completely alienated religious minorities/non-Muslim citizens of the country. Since the creation of the blasphemy laws the religious zealots have been exploited throughout for their ulterior gains. The blasphemy laws are disputed since its beginning. In early 1992, first ever fake case of blasphemy happened in the history of Pakistan in which Mr. Tahir Iqbal, a paralytic Christian convert from Islam to Christianity and resident of Lahore, was allegedly accused of abusing Prophet Mohammad and the charges were that he was teaching anti- Islamic education to children during tuitions. He was arrested and later was poisoned and brutally killed in Kot Lakhpat jail, Lahore. This brutality and inhuman act was never accepted by the human rights groups and individuals consequently they raise their voice and demanded repeal of all discriminatory Laws especially the Blasphemy and Hudood Laws but unable to rescue every victim of religious intolerance and intimidation. It has also been observed that the problems faced by victims belonging to the minority community multiply on account of a culture of suffering and silence which fears of further retaliation. The victim feels more comfortable if they are able to get in touch with human rights activists from religious minorities and lawyers to seek assistance. Violent circumstances against non-Muslim citizens of the country stimulated an initiative of motivation of help persecuted Christians for Mr. Francis to rescue of every victim of religious intolerance and oppression. The objectives and methodologies adopted as to provide legal aid assistance & representations in court trials, settlement, rehabilitation, shelter/protection, sexual abuses and domestic violence. The ultimate goal of CLAAS is to work for the protection and promotion of human rights and elimination of all forms of violations and help to build a just and peaceful society. The main objectives of CLAAS is to provide legal aid assistance, settlement, protection, rehabilitation for survivors of religious intolerance (especially men, women & children) and fortification of persecuted places of worships desecrated by Muslims fanatic and extremists.